The 21st Century Cures Act (Cures Act) was recently signed into law with overwhelming bipartisan support. It provides exciting opportunities for developing or expanding criminal justice and behavioral health collaboration to reduce the disproportionate prevalence of justice involved persons with mental illness. 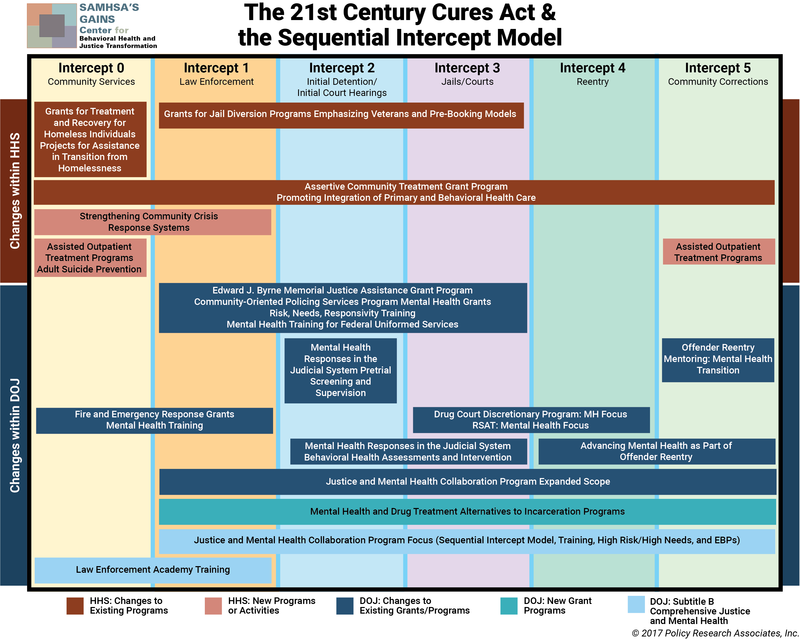 The Cures Act provides for a broad range of programs through multiple funding streams, including funding for program development and enhancement of services across the six intercepts of the Sequential Intercept Model. Even in communities with on-going collaboration between criminal justice and behavioral health systems, utilizing the Cures Act to its maximum benefit can be confusing. For communities without stable partnerships, accessing some of the Cures Act’s funding may be a challenge. The Congressional Research Service report on the Cures Act provides an excellent overview of the different funding streams and varied focus of the grant programs. Funding will be distributed through the U.S. Department of Health and Human Services (HHS) and the U.S. Department of Justice (DOJ). Some of the funding is dedicated to reauthorization and expansion of existing programs, while other funding is for new grant programs. Some of the funding still requires congressional appropriation. Funding streams to states include HHS Mental Health Block grants, DOJ Edward Byrne Memorial Justice Assistance grants, and DOJ Community Oriented Policing Services (COPS) grants. How these block grants get distributed by the states to the communities will likely vary state to state, but it stands to reason that if communities are proactive in developing their cross-system partnerships and identifying program needs, they could more effectively advocate for those funds. Funding streams will also be made available through competitive grants by the DOJ’s Bureau of Justice Assistance and HHS’ Substance Abuse Mental Health Services Administration. In fact, the BJA Justice and Mental Health Collaboration Program (JMHCP) FY 2017 Competitive Grant Announcement is out now (applications due April 4, 2017!). Applicants for these competitive grants will have to demonstrate partnerships between criminal justice and mental health services and be able to describe a program approach. How can communities take full advantage of the Cures Act? The Sequential Intercept Model (SIM) has proven to be an effective strategic planning tool for both states and communities. When the SIM is applied to the Cures Act, communities can more easily examine the funding and programmatic opportunities offered by both HHS and DOJ funding streams. The matrix below depicts the funding source and program initiatives as they fall across the six intercepts. In addition, the matrix depicts the funding streams, program focus, and whether funding is for existing programs or new grant programs. It also which Intercept a particular initiative falls in and whether an initiative spans multiple intercepts. Knowing which intercept(s) are targeted helps determine who key partners should be in program development. Text-based version of the matrix. It should be noted this graphic does not depict every specific funding opportunity and is meant to serve as a starting point for community discussion. Notably missing is the depiction of the $1 billion in Opioid Prevention and Treatment funds. These funds have applicability across intercepts, including police involvement in early engagement and deflection, court-based initiatives, or reentry initiatives to ensure Medicated-Assisted Treatment upon release. The Cures Act provides funding for communities through the JMHCP grant program to secure funding for SIM workshops. Communities can use SIM workshops to determine implementation strategies for funded grant program as well as examine additional program and funding opportunities presented by the Cures Act. In addition, the SIM can help communities examine how other Cures Act funding initiatives (communities could have multiple Cures Act initiatives) can complement each other. Overlook opportunities for cross-system collaboration. Griffin, P., Heilbrun, K., Mulvey, E., DeMatteo, D., and Schubert, C. (Eds.). (2015). The Sequential Intercept Model and Criminal Justice: Promoting Community Alternatives for Individuals with Serious Mental Illness. Oxford University Press. I am dealing with multnomah county portland or. I am not pleased one bit. My son Jordan Kraft is schitzophrenic while in psychosis he attacked his brother and i. There now is a no contact order prohibiting all contact the reason stated so we don’t communicate about the case. My son has been in jail since feb.6, 2017. No evaluation has taken place and his condition is worsening. Jail is not a treatment facility. I have many concerns surrounding this case . Jordan was held for over six hours before being booked. Officers were aware this was a mental health crisis and even so he was placed into jail. His pschosis has never received any medical treatment . If we are going to fix and correct what is wrong within a system the good must outweigh the bad. This is intentional harm being inflicted by holding him an environment not capable and lacking the skills necessary to manage his disease. Since my son become ill I have encountered systematic failures at every turn . I have been verbally abused by police officers whom refused to take a missing persons report on my son. He was missing for seven weeks he had walked to El Paso Texas. If all players do not have extensive knowledge regarding mental illness they have no business in even attempting to interact with this vulnerable population of human beings.